Accidents are the mother of all invention <?> I burned a hole in this flux tub months ago, inserted a toothpick and have been using it as dispenser ever since. I'm sure a cleaner job could be done with a drill but accidents will happen! If it had a flat bottom it would be perfect. The Green Man says: He who has smelled the smoke is never again free. I like it! I have a the same can of flux and it has always had a splinter of a posicle stick stuck in with the lid propped up by it. And it has been a pain and dropped and made messes. I'm gonna drill a hole in mine tomorrow. And I may even upgrade to a tooth pick! I use liquid flux in a small glass vial with the glass dropper. Knocked it over on the bench countless times Spend another hour wiping, cleaning, tools with alcohol. I never use the original plastic container, I transfer gobs of flux to a metal cup and work from the cup. There's even blobs of solder mixed in with it, good for tinning the ends of wires. Nothing goes to waste. 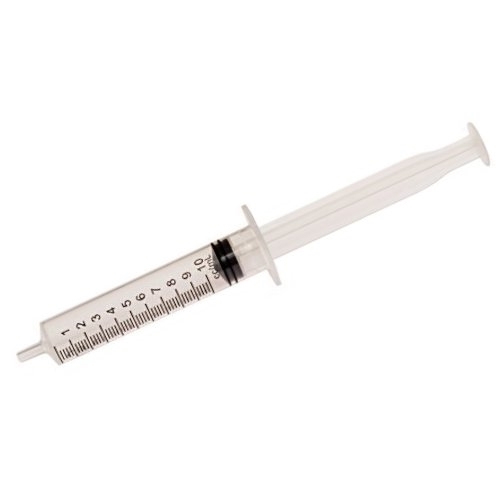 Baby feeding syringe aka oral syringe. Fill with a wooden Popsicle stick. Pennies from any pharmacy.